Christina Huang worked in the fashion world before realizing that she flourished more in the kitchen. So she realized the Grand Diploma and opened Zaoka, a Taiwanese fusion restaurant in Paris. I have always been very passionate about gastronomy and believe that life is about good food and travelling. When I was working in the luxury fashion industry, all that people around me cared about was how to keep slim in order to be able to wear beautiful clothes, but I realised that I cared much more about delicious food than being slim. That is why, when I decided that I wanted to have my own business, a restaurant was my first and only choice. Therefore, I left my job and headed to Paris, the capital of gastronomy, to learn French cuisine and pastry in a city which is full of surprising restaurants. My favourite memory from Le Cordon Bleu is when I worked at the school. Fortunately, I had the chance to be both pastry and cuisine assistant. I have always loved this job, it gave me the chance to work closely with our great chefs, especially in the demonstration classes which also enabled me to discover my interest in teaching. I really enjoyed helping students in the demonstrations. I thoroughly enjoyed this work experience and every time I go back there, I feel like I know everyone who works there which makes this prestigious establishment more than just a school for me. Le Cordon Bleu Paris is not just the school where I trained, but also my home in France. I have changed career path a few times. I studied literature for my degree and then management for my masters. I worked in luxury fashion, which is a far cry from the culinary world. However, I always dreamed of having my own business, so I decided to combine my favourite interest and my dream in a restaurant: ZAOKA - a Taiwanese fusion cuisine restaurant in Paris. This restaurant represents my culinary spirit: fun, multi-cultural, experimental; and fusion tells my story, the adventure of a Taiwanese girl who has dabbled in different fields and been to various countries, and eventually found where she belongs: Paris. When and how did the culinary adventure begin? I started to fall in love with cooking and baking while studying for my management masters degree in the UK. It has become one of my favourite activities and I enjoy travelling and tasting food in different countries. When I wanted to choose a school for my professional training, Le Cordon Bleu Paris was the dream choice. Its international environment definitely gives students like me a great chance to be introduced to French culinary techniques and culture more easily. Also, thanks to its bilingual setup, we had the opportunity to meet amazing Chefs from the world over and build a global view of gastronomy. To find a good mentor to lead you on this path. I have always been very lucky to have different chefs coach me on this road. My thanks go to all Le Cordon Bleu Chefs, and the chef at the Ministry of Foreign Affairs where I did my internship. Without their encouragement, I don’t think I would ever have got as far as having my own restaurant, ZAOKA, in Paris. Another piece of advice is that it’s never too late to chase your dream. Unlike many chefs, I didn’t start on my culinary path very early, but your determination to follow your dream is more important than any other constraints. For opening our restaurant ZAOKA, my daily life usually involved non-stop meetings including renovation, design, finance, marketing, administrative paperwork…and the most important part, creating recipes. Every day, when I work in the restaurant, I talk to the curious people passing by and encourage them to come and try our food. Being your own boss is the coolest thing ever, but it also means that you have a great deal of responsibility, for your company, staff, investors and clients, it’s completely different from working in a big organisation. Meanwhile, I spend a lot of time travelling around and tasting food, this is my way of keeping balance and following my passion whilst still living my dream life in Paris. To expand our ZAOKA brand and to open different kinds of restaurants all over the world. 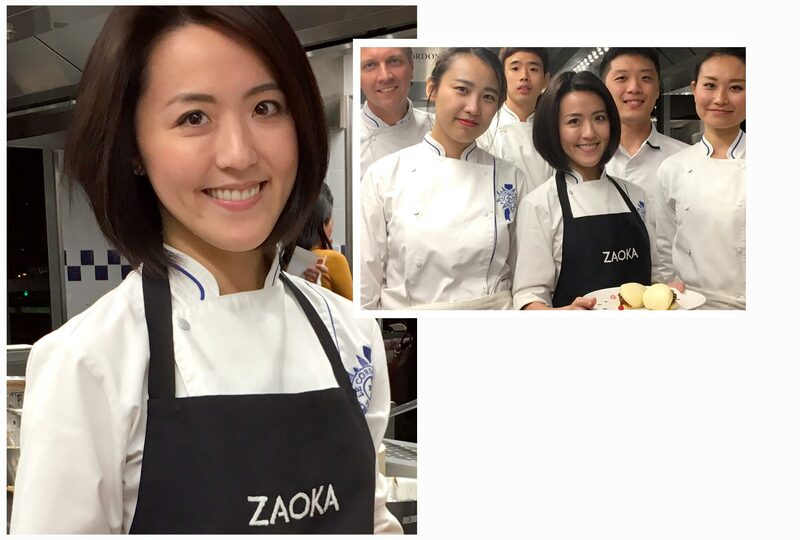 “A dream can never be too big…” ZAOKA is the first step, a way of introducing my culinary passion and the multi-cultural side of Taiwanese fusion cuisine. As a Taiwanese, I have always been committed to introducing this amazing cuisine to the world and, thanks to French cuisine and pastry techniques as well as the culture I have acquired, we are now able to combine all our culinary imagination into a different concept. I hope this brand will open a new door for westerners to try quality Taiwanese food. When I worked at Le Cordon Bleu, I really enjoyed helping Chefs to teach in the demonstration classes. I hope, therefore, that one day I will have the chance to go back to teach in the prestigious Le Cordon Bleu Paris, to transmit my culinary passion to the great chefs of the future.